Building A – Livestock Building is an infrared photograph of the 1929 Livestock Building located on the Pacific National Exhibition (PNE) fairgrounds in Vancouver. 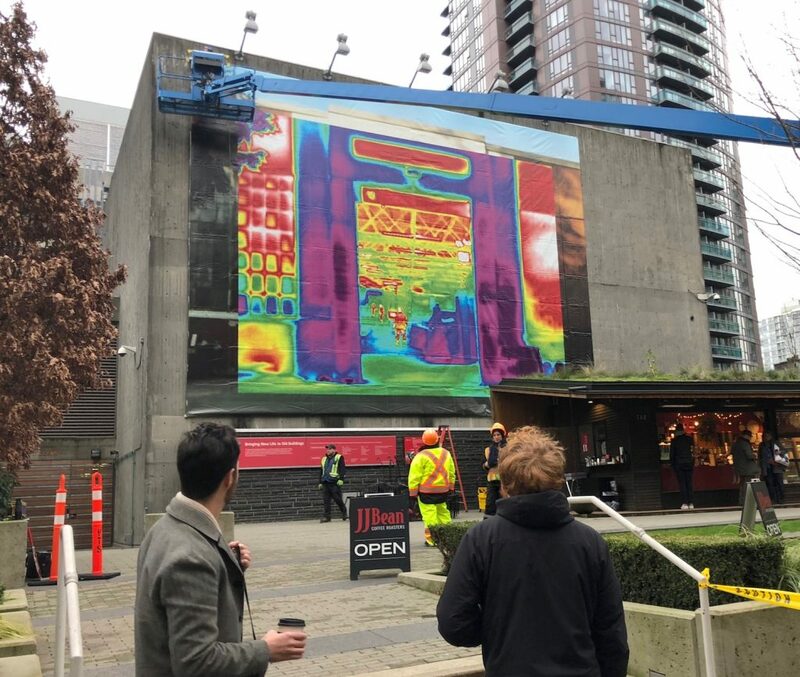 The image was captured by a thermal imaging camera, normally used by the construction industry, designed to display differences in temperature by detecting light rays that are invisible to the human eye. Most PNE fairgoers are familiar with the Livestock Building, entering through one of its many barn doors along its south side to cheer on the baby pig races, pet the chickens, llamas and rabbits, and ogle animals large andsmall. What is not so evident when wandering through this expansive space was its change of use in 1942 when the grounds, then known as Hastings Park, were expropriated by the Department of National Defense. With the declaration of war against Japan, the Government of Canada evoked the War Measures Act and authorized removal of “all persons of Japanese racial origins,” from the west coast “protected area” of British Columbia, even though the majority were Canadian born and Naturalized Canadians. Some 22,000 Japanese Canadians, then labeled “enemy aliens,” were uprooted from their homes and sent to various sites, including internment camps, road construction camps and sugar beet farms in the BC interior, Alberta, Manitoba and Ontario. All personal properties, such as fishing boats, farms, businesses and homes, were confiscated and sold without owners’ consent to cover the costs of their internment. Beginning in March 16, 1942, some 8,000 persons, removed from fishing, lumber and mining villages along the north coast and Vancouver Island, were held at Hastings Park. The stables and cattle stalls of the Livestock Building were converted into a makeshift women and children’s dormitory. Other structures were used as boys and men’s dorms, mess halls, kitchen, hospital and isolation ward. By September 1942, there were 3,866 women, men and children living in various buildings on this site. The archival photograph above was taken by local photographer Leonard Frank who was contracted to document the internment process for the BC Security Commission. 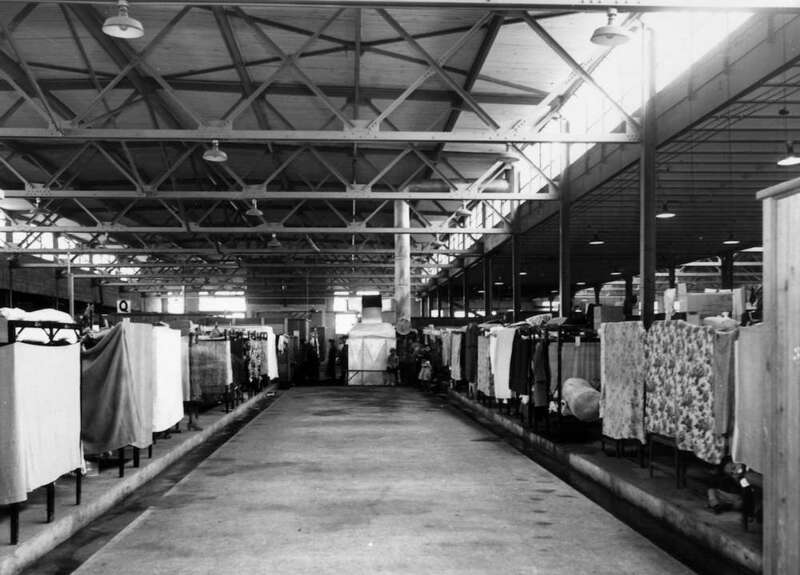 This image portrays the interior of the Livestock Building, with bedsheets dividing the living quarters. 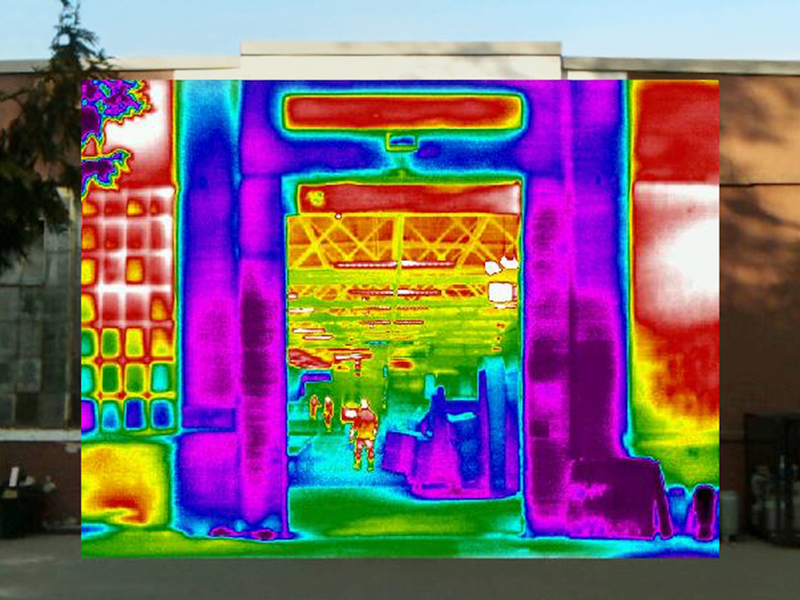 The thermal photograph above analyzes this same space in a different light, translating infrared radiation into the more limited spectrum of colours that our eyes are able to perceive, in an attempt to detect and expose not only the current condition of this building, but also the past and hidden histories inscribed within. Building A – Livestock Building is a public art initiative made possible through a partnership between the Vancouver Heritage Foundation, CBC Radio-Canada and the City of Vancouver Public Art Program, with support from JJ Bean Coffee Roasters.